This week I dedicated the majority of my time to tasks that will help streamline the process moving forward as well as converting the three panel animatic to a four panel one. Additionally I found a new solution for our shot counters and IDS and met/brainstormed with the illustrator to come up with solutions to several of our 2D elements. -What I did: I converted the three panel animatic to a four panel animatic to include facial reference for the animators. I also cleaned up the audio and remastered the levels. -Good: Audio sounds much better, foot steps sit in the background where needed and voices come to the fore front. The four panels also really show off just how much we’ve done and should make critiques more efficient once dialogue starts to roll in. -Bad: Need to finish brute forcing the shot IDs and titles into place. Will be wrapped up by Tuesday. -What I did: Met with the illustrator, brain stormed look and feel for rest of unfinished motion graphics shots, the sigil in lake’s notebook, statue concepts and final monster design. More progress! I was hampered last week by a lack of files to work with, this week I haven’t had that problem. Most of my time was spent working on the animatic and building the template for the three panel display. Additionally I met with our Illustrator and moved forward with the motion graphics sequence as well. What I did: I updated the timeline with new footage and worked on cutting together an edit of our animation out of purely reference footage. Established pipeline for quickly iterating animatics moving forward. Pros: The new footage is looking great and having some splined playblasts really helps with timing. Cons: Now that I have moving animation we need to lock down the audio ASAP. I’m meeting with the animators tomorrow to solidify which lines run into which shots. Cons: From a purely cinematic standpoint some of the shot re-arrangements are slightly weaker but the benefits in saved animation vastly outweighs the negative. Most of my time this week was spent planning the next stage of the motion graphics sequence, contacting an illustrator for additional 2D assets and putting together the first 3D Animatic. I’m still waiting on a fair amount of footage but this first cut has already been helpful in its current state. Additionally, I wrote a few minor script revisions to address feedback from our end of term critique. What I did- gathered playblasts from several animators and began to fill them into the current Animatic cut. Tweaked audio and overall timing to match footage where needed and updated new footage with shot names and frame numbers. Changed overall FPS from 30 to 24 across the board. Cleaned up shot titles and labels. Good – Now that I can see some things in motion I’m able to get a much clearer view on the actions of each shot and have been able to hone in on our timing. Moving forward into next week I’ll have additional feedback for the animators about shot length that I wouldn’t have been able to glean from storyboards. Bad- the current effect I’m using for shot name and counter isn’t too friendly on scaling which has been going haywire due to the different qualities of playblasts. Moving forward I’ll have to institute new standards for playblasts to prevent the discrepancies in picture quality and format between animators. Good- lake’s camp has been squared away pending minor dialogue tweaks. Scene builds much more effectively. Bad- Airplane still needs to be tackled, city reveal needs more punch. Will experiment with editing the Animatic. What I did- Recruited an illustrator to assist with notebook, motion graphics and mountain-monster design. 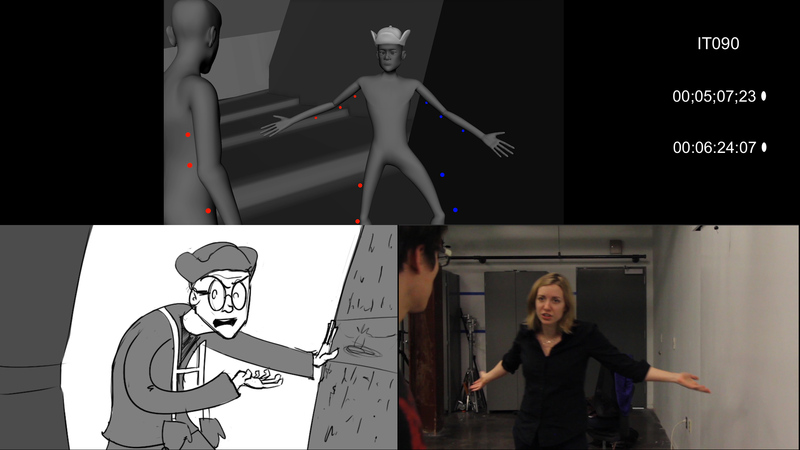 Good- Freeing up David from further 2D work allows him to focus more on animating and will help give the motion graphics sequence an extra bump. This week I’ve been focusing on taking our animatic to the next level for the presentation and I took several steps to achieve this. I legally obtained a copy of the Hollywood Edge Premier sound FX package and with it I’ve been able to sling in all of the sound effects needed to give our animatic that extra air of believability. In addition, I met with Special FX Editor Brian Baker of Dive over lunch to get a last round of comments and crits on our shot order and timing. Pros- The Sound scape really rounds out the animation and gives it that extra air of believability. Cons- Still need to simulate environmental effects on voices and certain sound FX. This week was yet another spent refining the Animatic. We finally have reached a place where we’re comfortable taking it to the editing faculty and getting feedback. Pending their commentary on the timing and one or two more versions we should have a completely finished animatic by the end of this week (assuming we meet with the faculty). I continued to focus on the animatic this week as we’re quite close to finalizing our timing. One of my main goals for the end of this week was to apply several changes that would let us get the most out of our Animatic. These features include a running shot timer for the entire animation, a shot timer for each individual shot and the shot’s scene title clearly displayed. In addition I’ve also been experimenting with Shoggoth sounds and have been steadily building a sound-scape to assist in blocking in folly later on. Pros- A lot of progress has been made and the video is slowly becoming a more and more useful tool for moving forward. Cons- Still waiting on a response from the editing faculty. I’ve began work on the motion graphics portion of our animation by assembling rough comps and experimenting with camera angles. I’ve also been conceptualizing the ending credits as well and have been in contact with a third party 2D artist to discuss procuring art for different solutions. This was quite the productive week! Pre-production is in full swing and as such I’ve been busy this week. In addition to wrapping up layout and finishing the first draft of the Animatic, the stars aligned and I was able to record final audio from all three of my actors including all grunts and sighs and ooh and ahhs. Summary– I brought all three of my actors into the studio and ran through the entirety of the script, making adjustments where needed. Additionally, I hauled an EX camera into the studio to gather reference for our animators. Cons- I brought two cameras to capture with but one was missing the micro SD card so I had to make due with one (which was still more than sufficient for my goals). Summary- I finished the rough draft of the latest Animatic and integrated the place holder audio. For Tuesday I will be integrating the final audio as well as additional motion graphics to give more life to the storyboards. Pros- Stronger visual direction, good length, good sense of timing. Cons– Could be more highly animated, a problem which I hope to solve by Tuesday. Summary- revised scene layout based on critiques and comments from animators. 11-10-14- Ethan Miller – PPJ – Progress! It’s been a busy week! Ever since we locked down our script my pipeline has opened up completely. I’ve moved forward on the Animatic and should have a finished first draft by the end of Monday. Additionally I’ve taken it on myself to film motion capture reference for our animators for several pivotal scenes while wrapping up the last stages of camera layout. I brought in our Danforth actor to hop into the motion capture suit and perform his scene in 3D space. Connor Behm is a professional stage actor and his training really shows when given the opportunity to flourish. In addition to gathering the 3D data, we also recreated the argument scene shot for shot to be used as additional reference by the animators. I’ve been wrapping up Layout this week as Gabe Dave and pat move to start animating. At the moment these scenes only have basic geometry, but I look forward to populating them with more detailed topology. Pros-Moving into the final stages, meetings with animators went well and proved fruitful. Cons- Still a tad bit more to do. It feels good to be making progress on the Animatic. As the last of the storyboards have been trickling in I’ve been syncing up boards and audio. I still have a bit more polishing to do, but I’m pleased to report that I should have a finished first cut by the end of tomorrow. Pros- Progress! Very nearly there, just one more push. Cons- I would like to have finalized audio at this stage, but co-coordinating three professional freelancers can be tough.